Front Binding – Our second William Sharp request follows the first (and is the last of this summer’s requests; thanks to everyone at the Devotees for their interest! ), and this particular commission follows the standards of Samuel Pepys’ Diary. There are lots of smaller, intricate line drawings printed in brown ink throughout the text. I must admit, Sharp is quite good at this, but I prefer the work he performed for the Poe collection to these. 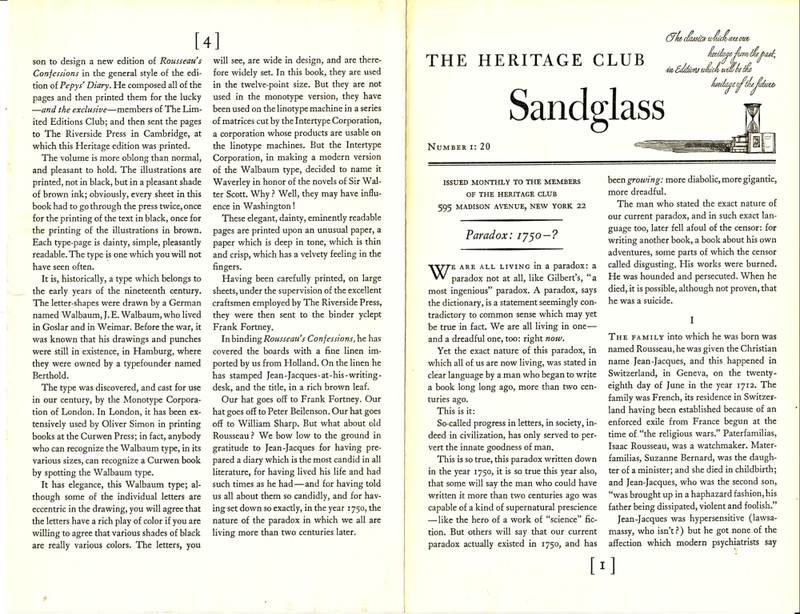 The Sandglass noted that Sharp was requested by Macy for the Pepys set to follow Adolph von Menzel’s approach for The Memoirs of Frederick the Great (which Macy earlier issued under the Reader’s Club banner in Bruno Frank’s novel on that king, The Days of the King), and that his successful venture at that commission made him the clear choice for the LEC Rousseau. As for Msr. Rousseau, this is his sole outing for the George Macy Companies. Of all the things to choose from of his repertoire, this is clearly the most well-known! His candid autobiography solidified him in literature’s hall-of-fame, published in full three years after his death. Macy (I believe he was still well enough in 1955 to record his opinions via LEC letters and Sandglasses) notes that he is following the Nonesuch Press in his choice to utilize an anonymous translation from 1783 and 1790 for his issuing, recruiting A.S.G. Glover to restore exorcised passages that the original translator deemed prudish. 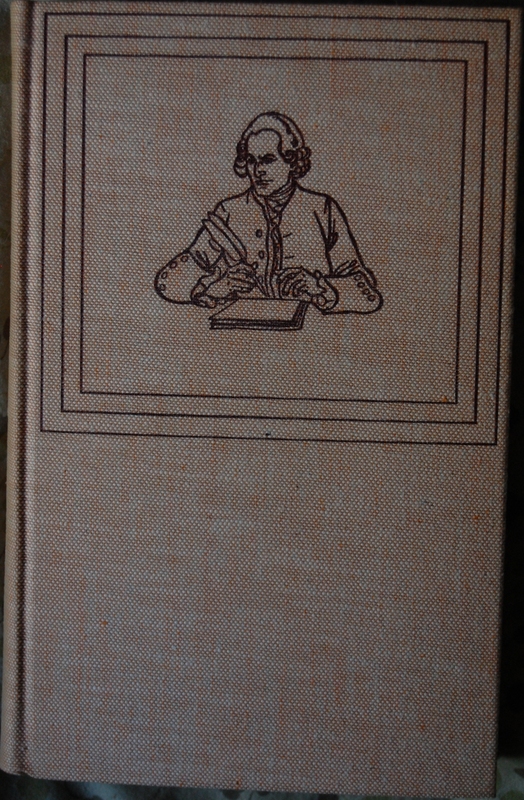 Thus, we have here a complete English edition of Rousseau’s exploits. Design Notes: Peter Beilenson served as designer for this edition (and the LEC original). 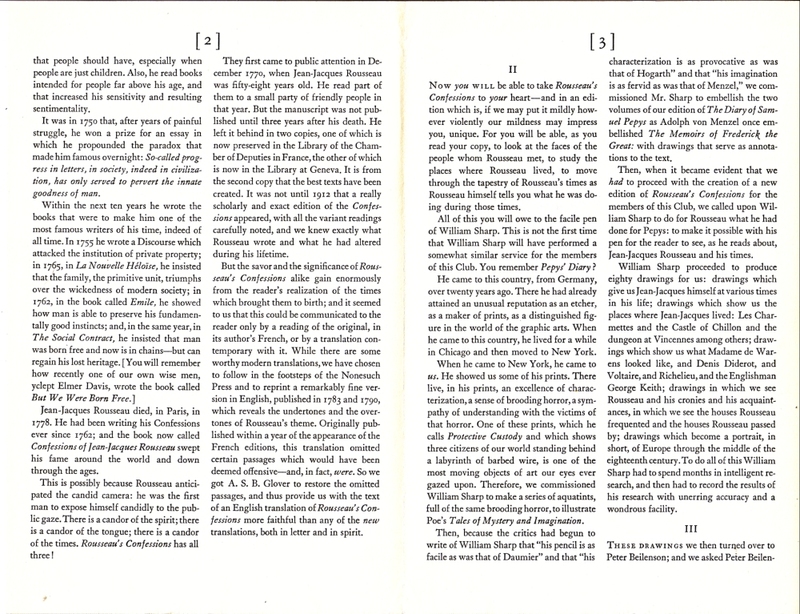 The Riverside Press (see Robert’s comment below for a nice condensed history of the press) handled the printing of the HP volume, using Waverly as the primary font. It is based on the Walbaum font (the Curwen Press used it a lot, apparently), which was not available as a monotype in 12 points according to the Sandglass. The Intertype Corporation made a linotype, modernizing Walbaum and redubbed it Waverly. Frank Fortney bound the book, as is common. 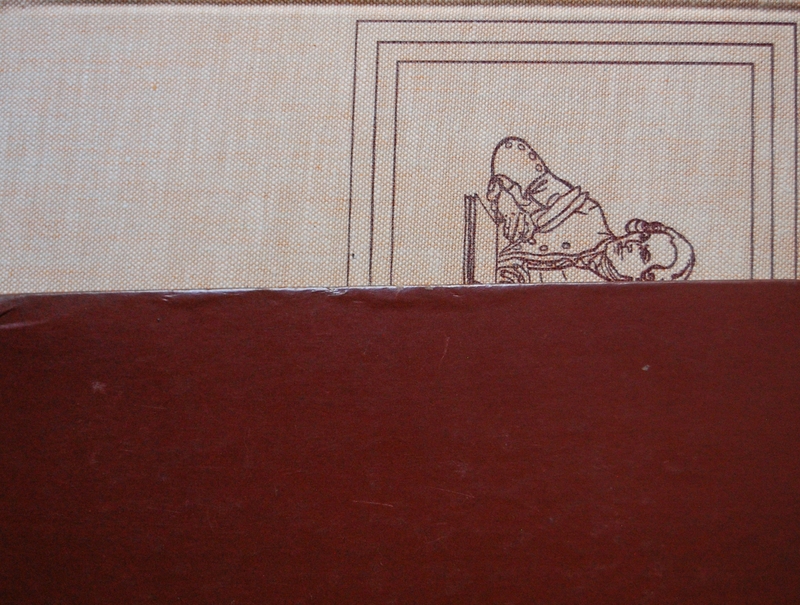 The linen for the boards is from Holland, with brown leaf stamped into the boards for the spine’s title and Sharp’s portrait of Rousseau on the front. The paper is “unusual”; a velvety, thin and crisp stock with deep tones. Title Page – As mentioned above, A.S.B. Glover handled the editorial work here, taking the anonymous translation of the late 1700’s and giving it the finishing touches it needed. He also introduces the book. 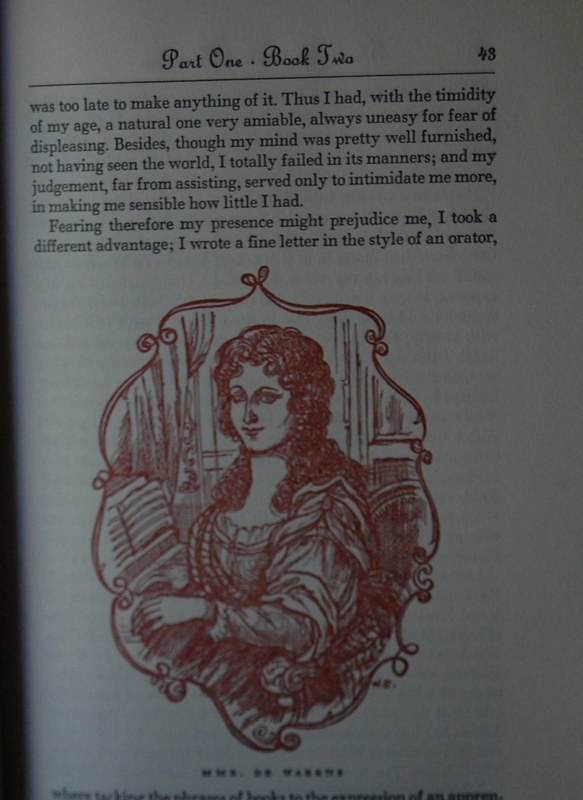 Page 3 – The line drawings are much more in line with Pepys’ Diary compared to the work Sharp did in the Poe Tales. They’re a good fit, if you ask me. Page 43 – Some rather rnice portraits in here. Personal Notes – I bought this at Second Time Around Used Books in Merced for $15. It’s been read before (there’s some penciled markings on key passages inside), but the condition was remarkably solid otherwise, so I figured why not. Another fine post on an exceptionally fine book. 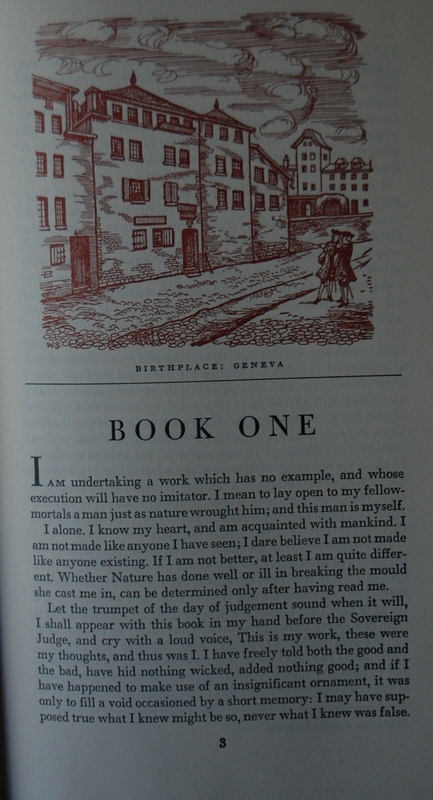 This was printed at the Riverside Press, which was where Bruce Rogers established his reputation as the greatest book designer of the 20th century. They have printed many famous and desirable editions over the years, including the marvelously-illustrated (by Childe Hassam, Howard Pyle, Jessie Wilcox Smith, Frank Schoonover and similar luminaries) 22 volume edition of Hawthorne’s complete works, multi-volume editions, beautifully-printed and bound, of the complete works of the great 19th century American authors, the first edition of Agee and Evans Now Let Us Praise Famous Men, the N.C. Wyeth-illustrated Odyssey, the Bruce Rogers Rubaiyat, and, for those of us who prefer our Chaucer in its original Middle English, the Riverside Chaucer. A division of Houghton Miflin for many years, they are responsible for many well-printed textbooks, known for durability. Thanks for expanding on the Riverside Press, Robert. :) I’ll point people to this when I update this next. 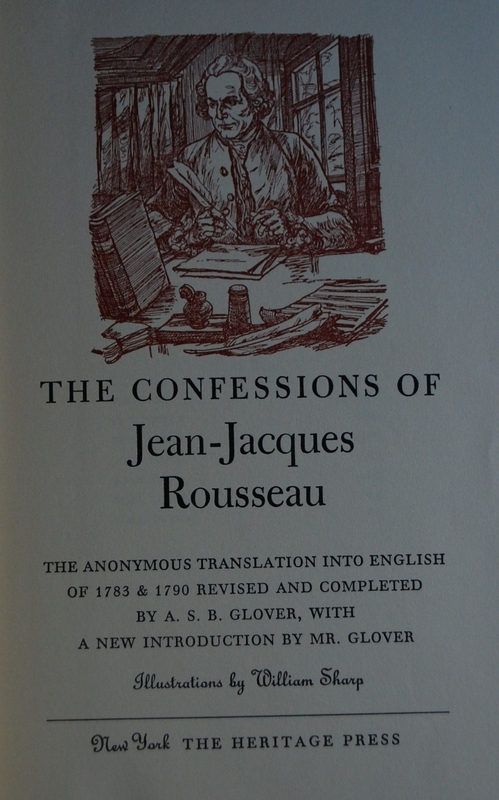 You are currently reading Heritage Press – The Confessions of Jean-Jacques Rousseau (1955) at The George Macy Imagery.